Earlier in the week, we kicked of Design Works International Doodle Month because of today! verb [ no obj. ]; scribble absentmindedly: he was only doodling in the margin. noun; a rough drawing made absentmindedly. ORIGIN early 17th cent. (originally as a noun denoting a fool, later as a verb in the sense ‘make a fool of, cheat’): from Low German dudeltopf, dudeldopp ‘simpleton.’ Current senses date from the 1930s. Though the formal definition of doodle and doodles are lighthearted and fun, sometimes those absentminded scribbles end up as art. Next time you’re on the phone or in front of the television and you find you’ve left your mark on the take out menu or napkin… hold onto it, you never know what it might lead to. 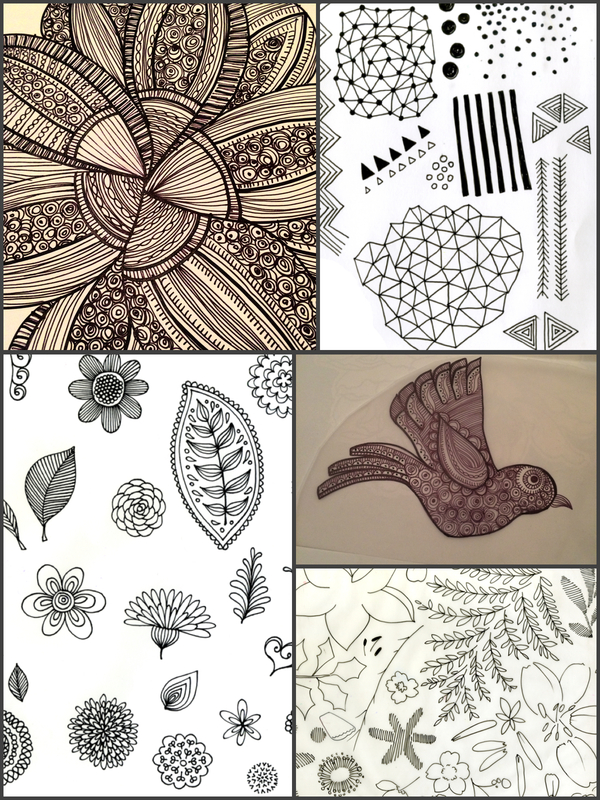 At Design Works we think that doodles can lead to great things. These examples are some odds & ends by our staff of original print artists which end up being gorgeous original prints. We invite you to contact us to see our extensive line of original artwork from artists all over the world, maybe you’ll even recognize a few of these doodles! This entry was posted in art, creativity, Design, DIY, Drawing, Fun, graphic design, Illustration, inspiration, New York City, Trending, Trends, Uncategorized and tagged art, Design, Design Works, Design Works International, Design Works International Doodle Month, Doodle, Doodle Day, doodling, Fun, HGTV, HGTVHome, Home, Local NYC Artists, Nancy Fire, New York City, NYC, sketches, Sketching, Surface design, Textiles, Trend Blogs, Trend prediction, Trending, Trends by Design Works International. Bookmark the permalink.